The use of bipods with rifles dates back to 1938, when gunners and snipers started using them for support. A bipod is often a necessity these days for shooters. Here, we’ll be talking about the pros and cons of using a bipod and if it will help you understand if you really need one. We will also review the best bipod on the market for your AR-10 rifle, so you can quickly make a buying decision. TipTop Tactical Rifle Bipod Quicklock EZ Pivot & Pan QD 7" - 10.5"
What is a Bipod Best For? Let's find an answer to this question from a general viewpoint and a viewpoint considering the AR-10. 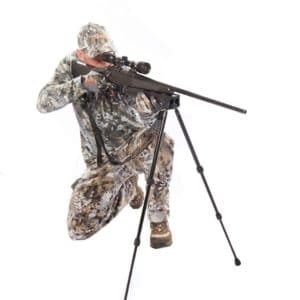 The basic and intended function of a bipod is to provide a stable platform for shooting. A bipod makes you feel exactly like when you’re shooting from a bench rest or using a range bag. It is intended to make you comfortable with shooting your weapon, even in the most rugged and uneven terrains. A bipod is best for medium and long-range shooting. It can also be used for close range shooting if the situation gets worse. Bipods often have adjustable legs with a rotating swivel, allowing you to pan your rifle easily. This allows you to retain your position and prevents you from making necessary adjustments when you change your aim or target. These features comes in handy when you have to shoot moving targets. A bipod is quite useful when you are lying prone as it levels the rifle with your shoulder, without the need of any base support like range or duffel bags. Additionally, a bipod offers a plain and stable platform for shooting which doesn’t require adjustments every now and then. Thus, allowing you to focus upon your shots rather than quiddling with adjustments. Another very intrinsic feature of the bipod is that it protects your rifle from wear and tear to some extent. While on a hunting trip, novice shooters might use logs, rocks, branches, or any other such improvised surface to rest their rifle and shoot. The rough surface of such objects in combination with the recoil of the rifle results in considerable damage to the stock. The AR-10 is a powerful and accurate rifle, often used for long-range shooting. Using a bipod with an AR-10 greatly improves its accuracy and overall performance. Additionally, it also removes a considerable amount of weight from the shooters forehand, resulting in better efficiency. While there are a lot of options available on the market, the most common ones to be bought are metal composites, especially aluminum based bipods. Whatsoever, a bipod must be durable enough to withstand rugged use and recoil of your AR-10. 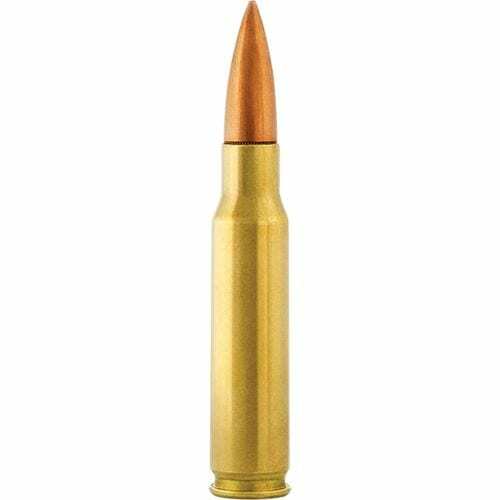 The AR-10 uses the 7.62 caliber ammunition which delivers quite some jerk back. Apart from this, the bipod should also be lightweight. The AR-10 is widely used for hunting big game, which takes a decent amount of trekking. A lightweight bipod ensures your rifle doesn’t add much weight to refrain you from using a bipod. Most AR-10’s feature a picatinny rail platform, while others have those old-fashioned handguards. A good bipod must be ready to use straight out of the box and should fit snug with the mounting platform. Although there are a lot of adapters and other mounting options, ready to use equipment is the best. QD mounts are better than those requiring screws and lugs for installation. A good bipod must be able to pan and cant through the axis/mounting point, so you can change your aim quickly. The pan and cant features allow the shooter to change the aim steadily without the rifle wobbling much. This also saves precious time when you are hunting small game. Most bipods have adjustable heights. Ranging from as low as 3-9 inches, to as high as 25-62 inches (like those camera bipods). You must assess your intended use and individual preference before choosing one. But using a bipod with adjustable height is essential. Additionally, an added sling mount will help in attaching slings to the rifle. Are All Bipods The Same? Not really. Different bipods differ in features. Some might come in handy for a specific set of shooters while some might not. It all depends upon the individual preference and the use you’re going to put your AR-10 up to. Below are a few factors which differentiate some bipods from others. Not all bipods have adjustable legs. Adjustable legs are an important feature of the bipod. Imagine yourself hunting in the woods. Sometimes you’ll find a high object like a large fallen tree to rest your bipod and sometimes you’ll find a low object like a small rock. You’ll have to make adjustments to your bipod legs to gain a perfect shooting stance. 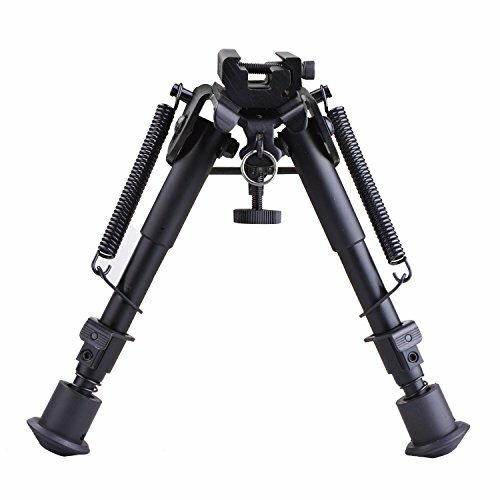 Additionally, a bipod having removable legs gives you a wider perspective of use based upon the situation or preference. Some bipods only have two locking positions: one vertical and other horizontal, while others have multiple or even adjustable locking positions. Some bipods even allow being positioned at a 45-degree angle forwards and backwards. Some bipods allow adjustable tilt and pan locking features, enabling you to lock your bipod in a specific shooting position. This may come in handy when you are shooting from behind tangled cover like bushes or shrubs. Based upon the information mentioned above, and the winning factors of a bipod, we have compiled and reviewed a list of the best bipods for AR-10. The Accu-Shot V8 Atlas Bipod features a durable aluminum body with steel locking components and grippy rubber feet. The legs have 5 positions and can adjust between a height of 5 inches to 9 inches and can be adjusted over 180 degrees from front to back. The bipod has a left to right pan angle of 30 degrees, allowing you to shoot moving targets easily. Additionally, the bipod also has 30 degrees of cant adjustment, making it even better for uneven surface. The bipod offers good value and can be easily switched over to other rifles. 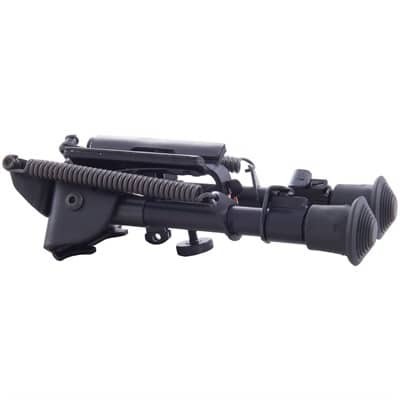 It is available in different mounting platforms mentioned below, all of which suit the AR-10. 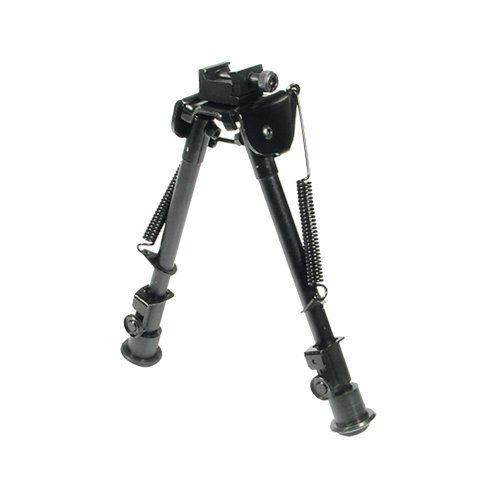 Overall, it is a good bipod with proper adjustments for height, pan, and cant movements. The scope is lightweight but is not very quick to deploy. The pan and cant motion is helpful but it doesn’t lock so it might not be that useful when hunting ducks or deer from a close distance. But the overall construction and quality are good. Perfect for Beginners. The CVLIFE tactical rifle bipod has 6-9 inche adjustable pods, with five height adjustments also between 6 and 9 inches. The frame of the bipod is a combination of hardened steel and aluminum, making it both tough and lightweight at the same time. The hard coat, matte anodized finish makes it resistant to rust and corrosion and thelegs can be folded up and down at a moments notice. The bipod is very light and also includes a picatinny mount adapter for quick mounting with your AR-10. The footpads of the pods are shockproof and anti-skid. 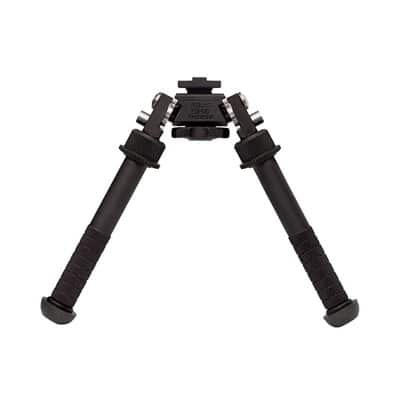 This CVLife Bipod is an inexpensive and durable product with limited features. The bipod doesn’t have a panning or cant mechanism, which is quite a disappointment. However, the scope has a super low price, which makes it a good option for shooters who are new to using bipods. This is a top pick as a learning model and can be used to teach the basics of a bipod or simple support. Harris Bipods need no introduction for their quality and effectiveness. Widely used by the U.S Military, the Harris Bipods are an effective solution for bipod needs. This S-BRM Bipod has been made using aluminum and high carbon steel. The bipod weighs a mere 0.8 pounds and can be mounted on your AR-10 using QD Swivel Studs. These swivel studs can also be used to attach a sling. The legs of the Harris Bipod are adjustable between a height of 6-9 inches, at 1 inch notched increments. 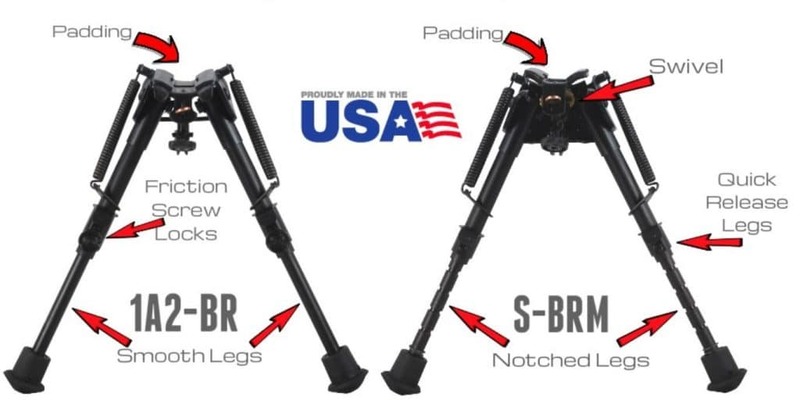 These bipods rotate 45° for instant leveling on uneven ground. 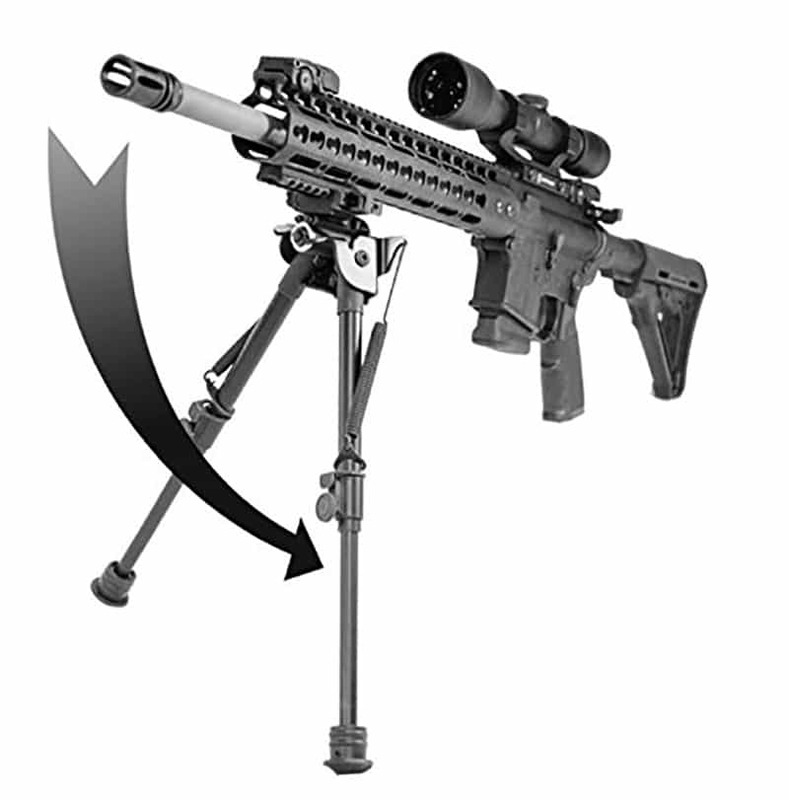 The Harris S-BRM is an ultimate bipod for shooters. Perfect for hunting, tactical as well as long- range shooting. This bipod has all features assimilated in one. Good for both average Joes, as well as experts. 4. 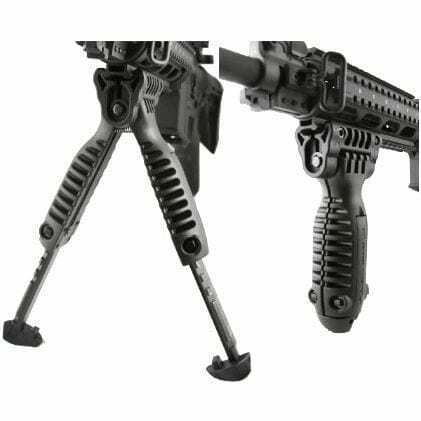 UTG Tactical OP Bipod, Rubber Feet, Center Height 8.3"-12.7"
Durable aluminum legs with a steel top platform which includes both picatinny and swivel stud mounts. This is a high bipod with height adjustments ranging from 8.3 inches to 12.7 inches. The bipod weighs only 13.2 oz and has fully extendable legs with a Posi-lock wheel and quick retraction button. The bipod can pan sideways and has a position lock for the same. 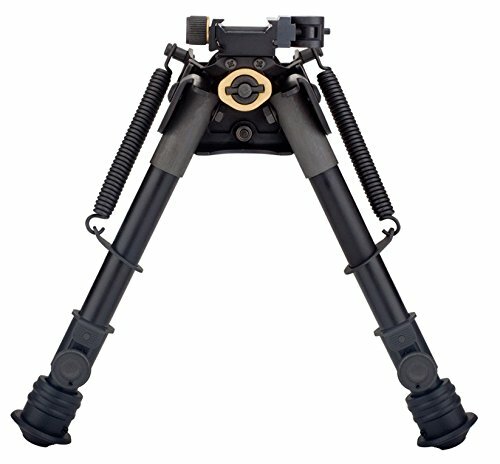 The rubberized footpads prevent the bipod from slipping when positioned. The package also includes a sling swivel stud adapter. The Bipod is more of a general purpose product with a subtle mix of good features. The Picatinny and swivel stud mount with sling swivel stud adapter make it useful for hunting and tactical use. A good option if you are not looking to spend a lot of money on bipods. 5. TipTop Tactical Rifle Bipod Quicklock EZ Pivot & Pan QD 7" - 10.5"
This TipTop Tactical Rifle Bipod is probably one of the best and most complete options in this list. The bipod has a patented quick lock mounting system which allows it to quickly attach and detach to a Picatinny rail. The variable height adjustments range from 7 inches to 10.5 inches, which makes it good for using 30 round and drum mags with your AR-10. The unique design allows both canting and panning. The bipod has a cant angle of 38 degrees and a maximum pan angle of 74 degrees. The integrated design eliminates the need for a bipod adapter. Rubberized based leg caps to prevent slippage at the base. The TipTop is a complete package with all the features sought after in a bipod. It has adjustable legs, canting and panning mechanism, patented quick lock, no need for an adapter and many other notable features. The bipod is priced well, and there are possibly no negative reviews on this product anywhere around the shooting community. A must buy and best buy product. A bipod helps to add stability to your rifle and provides you a nice shooting platform when you are not using the bench rest. A good bipod must be easy to attach/detach, have adjustable components (height, pan, canting) and must be lightweight. You must deeply assess your individual requirements and preferences before choosing a bipod with a combination of such different features for your AR-10.